NG Chin Siau sits in a small meeting room at the headquarters of Q&M Dental Group giving a five-minute history of the dental chain, and the numbers are flying fast and furious. He has just described how he had bought over the practice that he was working at in 1998, and then grew it at an average of about five branches a year after that. "Then we go to do an initial public offering (IPO) exercise in 2009 November 26," Dr Ng, Q&M's chief executive, begins to recite without so much as a glance at notes, which he does not have. "At that point in time, 80 dentists, 34 or 36 locations. Today, six years after IPO, we have 60 locations islandwide, 180 dentists, with 300 nurses and 50 admin staff. Our market cap at IPO was S$75 million to S$80 million on Day One, now today our market cap is about S$500 million to S$600 million. We also have business outside Singapore... Malaysia we have presence in Johor Baru, Malacca and Kuala Lumpur, fewer than 10 clinics. China we have presence in Liaoning Province and Shanghai. Liaoning we have three dental hospitals and three dental centres and one training centre. Shanghai we have one clinic. With about 100 dentists in China, 200 nurses, that's our strength in Liaoning. Malaysia we have fewer than 20 dentists and about 30 admin support staff. Also, we have one dental equipment supply distribution company." For Dr Ng, named the Best Mid-Cap CEO in 2015 at the Singapore Corporate Awards, an intimate knowledge of one's business is one of the best ways to navigate the big picture. If there is one thing Dr Ng knows, it is dentistry. He graduated in 1994 as a dentist, then served for about two and a half years as a general dental practitioner at the Ministry of Health. In 1996, he left public service to join a small private practice in Bukit Batok, where he quickly built up a following. "When I worked at the particular clinic at Bukit Batok, one day less than 10 patients. I grew the clinic to one day maybe 30 to 40 patients, in two years," Dr Ng says. "And I realised that the patients were all there to look for me. Before that, it was not so busy." He decided to make the leap to entrepreneurship. Dr Ng sold his three-room flat in Clementi for about S$180,000 to help pay for the practice, then moved to a rental flat within walking distance of his work. "At that point in time I didn't have money to buy the practice, so I sold my house," Dr Ng says. "My eldest daughter was just a newborn, just a few months old. And I made that decision to sell the only property that I had... I worked very hard. Go to clinic every day, treat patients every day. My only break was lunch and dinner. Night time, after 9-plus go home, eat a bit of supper, sleep, second day go to work again." Dr Ng no longer goes through that kind of schedule at the clinic. He stopped practising about four years ago, taking a pay cut and a step away from his passion, because he realised that his time was better spent on the corporate side of the business. Q&M has a stated goal of expanding in Malaysia and China, and a significant amount of Dr Ng's efforts these days is managing the merger and acquisition strategy. "You ask me to sit still, very difficult," Dr Ng says. "I always like to explore, and when I find opportunities that's good for the company, I bring back. As a CEO, as an executive director, we try to do everything in line with the interests of the company, minimise all the conflict of interest kind of actions. Then all our interests are aligned, we won't do anything wrong." Making sure that interests are aligned throughout the company is Dr Ng's way of ensuring that the integrity of the business is not compromised by new acquisitions and hires. For example, Q&M believes that the key management in the businesses it acquires abroad should remain as shareholders in the business, so that they still have skin in the game. Q&M is also trying to spin off its Malaysian and Chinese clinics and hospitals through an IPO, which Dr Ng believes gives his partners more reason to work. "My Chinese partner is motivated. On one hand he sold to me 60 per cent, he monetised his 60 per cent already. On the other hand he's still got 40 per cent, he still can bring it to IPO. So these guys are motivated, our interests are aligned," Dr Ng says. 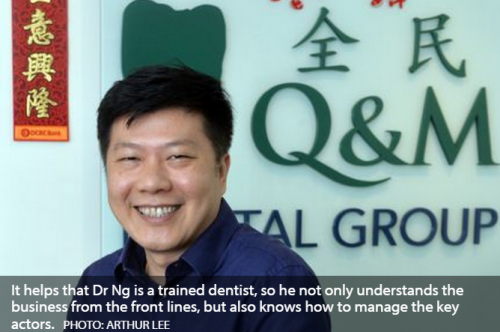 It helps that Dr Ng is a trained dentist, and so he not only understands the business from the front lines, but also knows how to manage the key actors. "You have to be very open-minded, have to be fair," Dr Ng says. "Because we're dealing with a lot of professionals. Professionals, if you're perceived as you're taking advantage of them, that's it. They will not work with you." At the root of this canal, there is no substitute for knowing your business well. "If you don't understand what's happening on the ground, you can't shape the decision at the top. So stay in touch with the ground," Dr Ng says. "As much as possible, don't just listen to the management team. Go deep inside and see, feel, touch by yourself... Now when it comes to all the details, I like to listen to the person who is doing it. If it's filtered by another layer, a general manager, a chief operating officer, you're just listening to the same guy. When you listen to the ground, people who are doing the work, people who are going around meeting clients, of course that will be the most accurate information. I like to do that. So when it comes to this, I don't want to listen to my higher management team."